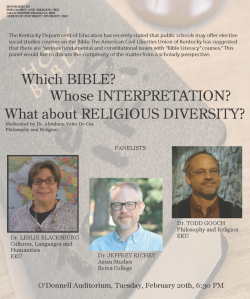 The Kentucky Department of Education has recently stated that public schools may offer elective social studies courses on the Bible. The American Civil Liberties Union of Kentucky has suggested that there are “serious fundamental and constitutional issues” with “Bible Literacy” courses. This panel would like to discuss the complexity of the matter from a scholarly perspective.